* Professor, Department of Oral & Maxillofacial Pathology, Azeezia College of Dental Sciences & Research, Kerala, India. ** Former Lecturer, Mar Baselios Dental College, Kerala, India. ABSTRACT: Pleomorphic adenoma, the most common salivary gland tumor, consists of epithelial and mesenchymal components. Its morphologic complexity results from differentiation of tumor cells into fibrous, hyalinized, myxoid, chondroid and osseous areas. The diagnosis is made by the clinical and histo pathological examination. The treatment of pleomorphic adenoma is surgical excision. Malignant transformation, though rare, has been reported. In this article, we report a case of pleomorphic adenoma with literature review. KEY WORDS: benign salivary gland tumor, ductal, myoepithelial, myxoid. RESUMEN: El adenoma pleomórfico es el tumor más frecuente de las glándulas salivales, con componentes epiteliales y mesenquimales. Su complejidad morfológica es resultado de la diferenciación de las células tumorales en las zonas fibrosas, hialinizadas, mixoides, condroides y óseas. El diagnóstico se realiza mediante el examen clínico e histopatológico. El tratamiento de adenoma pleomórfico es la escisión quirúrgica. La transformación maligna, aunque rara, ha sido reportada. En este artículo se presenta un caso de adenoma pleomórfico con revisión de la literatura. PALABRAS CLAVE: tumor benigno de la glándula salival, ductal, mioepiteliales, mixoide. The term pleomorphic adenoma was suggested by Willis (Rajendran & Sivapathasundaram, 2009). It was referred by different names like mixed tumor, enclavoma, branchioma, endothelioma, enchondroma, etc. in earlier years (Regezi & Batsakis, 1977). It is the most common benign salivary gland in children and adults. The morphological complexity, exists among the tumor between individuals and glands, and even within the same tumor, which actually explains the term 'pleomorphic adenoma'. 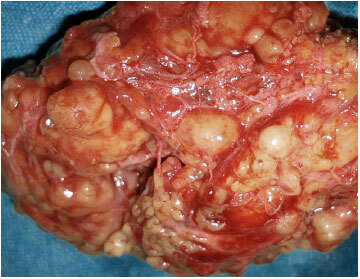 The histopathologic features of pleomorphic adenoma is pathognomonic (Stennert et al., 2001). It has been postulated that rather than simultaneous proliferation of neoplastic epithelial and myoepithelial cells, a single cell with the potential to differentiate toward either epithelial or myoepithelial cells may be responsible for these tumors. 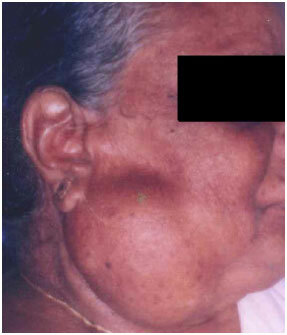 A 62-year-old female reported to the department of Oral & Maxillofacial Pathology with the complaint of slow growing swelling of right side of face. The swelling was noticed 6 months back. It slowly increased to the present size. There was no pain. On examination swelling was noticed extending over the angle of mandible, superiorly lifting the pinna of the ear, downwards cervically anteriorly up to middle of the body of mandible (Fig. 1). It was firm, with no fixation. No facial paralysis was noticed. On general examination, all other vital signs were within normal range. She was under medication for diabetes mellitus and hypertension for 7 yrs. FNAC was performed but was not confirmatory. An incisional biopsy was done (Fig. 2). An irregular mass with well-defined borders having an incomplete fibrous capsule was obtained. Cut surface was rubbery. 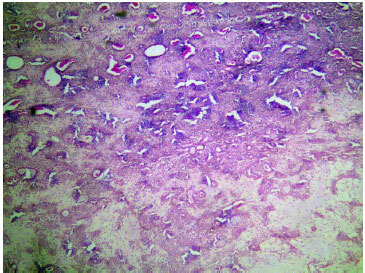 Histopathological examination revealed ductal epithelial cells arranged in the form of cords and sheets. A ductal pattern was noticed. The myxoid, chondroid and osseous areas was also seen (Figs. 3-5). Patient was referred to General surgery department of Govt Medical College, where surgical excision was done. Fig. 1. Clinical photograph showing the parotid swelling. Fig. 2. Photograph showing the biopsy specimen. Fig. 3. Photomicrograph showing tumor cells arranged in cords and sheets. Fig. 4. Photomicrograph showing ductal pattern and myxoid pattern. Fig. 5. Photomicrograph showing ductal pattern, eosinophilic material and myxoid pattern. 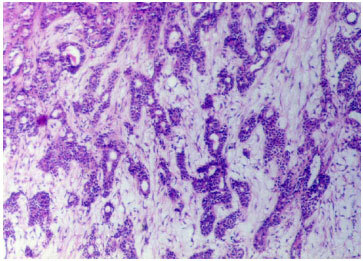 Pleomorphic adenoma or benign mixed tumor is the most common salivary gland neoplasm. It accounts for 53-77% of parotid tumors, 44-68% of submandibular tumors and 33-43% of minor salivary gland tumors (Rajendran & Sivapathasundaram). It is a benign tumor consisting of cells capable of differentiating to epithelial (ductal and nonductal) cells and mesenchymal (chondroid, myxoid and osseous) cells (Neville et al., 2009). Its morphologic complexity results from the ability of tumor cells to differentiate into fibrous, hyalinized, myxoid, chondroid and osseous areas, as a result of metaplasia or actual products of tumor cells per se (Rajendran & Sivapathasundaram; Friedrich et al., 2005; Frazell, 1954). Numerous theories have been proposed regarding the histogenesis of pleomorhic adenoma. It is related to the myoepithelial cells and to reserve cells in the intercalated duct. Neoplastically altered epithelial cells with the potential for multidirectional differentiation may be responsible for the tumor (Ellis & Auclair, 1996). Cytogenetic abnormalities of chromosome 12q 13-15 has been identified (Rajendran & Sivapathasundaram; Mendenhall et al., 2008). The putative pleomorphic adenoma gene (PLAG1) has been mapped to chromosome 8q12 (Neville et al.). Pleomorphic adenomas can occur at any age, but most common in young and middle aged adults, between 30 to 60 years. A slight female predilection is noticed. Most reported PA of parotid gland occur in the superficial lobe and present as a swelling on the ramus in front of the ear. The tumor is usually an irregular nodular lesion, firm in consistency, although areas of cystic degeneration may be palpated if superficial, and does not show fixation. Facial nerve involvement and pain are rare (Rajendran & Sivapathasundaram; Frazell). If neglected, pleomorphic adenoma can grow to grotesque proportion. About 10% of the reported pleomorphic adenoma' develop within the deep lobe of the gland beneath the facial nerve. A few lesions grow in a medial direction between the ascending ramus and stylomandibular ligament resulting in dumbbel shaped tumor that appears as a mass of the lateral pharyngeal wall or soft palate. Pleomorphic adenoma' of minor salivary gland commonly occur in the palate (50%), upper lips (27%) and buccal mucosa (17%). In cut gross sections, the tumor appears as an irregular - ovoid mass with well-defined borders. It may have an incomplete fibrous capsule or are unencapsulated. Cut surface may be rubbery, fleshy, mucoid, or glistening with a homogenous tan or white colour. Areas of hemorrhage and infarction may be noted. 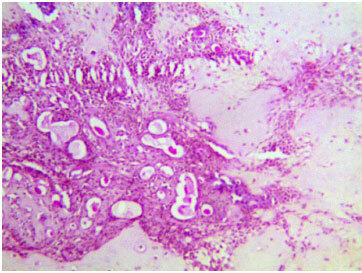 Pleomorphic adenoma, microscopically is characterized by variable diverse structural patterns. It consists of glandular epithelium and mesenchymal like tissue. Foote & Frazell (1954) categorized the tumor into a) principally myxoid, b) myxoid and cellular in equal proportion, c) predominantly cellular and d) extremely cellular. The epithelial component form ducts and small cysts that contain an eosinophilic coagulum. The epithelium may also occur as small cellular rests, sheets of cells, anastamosing cords and foci of keratinizing squamous, mucous or spindle shaped cells (Rajendran & Sivapathasundaram; Neville et al.). The myoepithelial cells have variable morphologies like angular or spindle shape, rounded with eccentric nuclei and hyalinized eosinophilic cytoplasm resembling plasma cells (hyaline cells). Accumulation of mucoid material around the myoepithelial cells give a myxoid pattern (Neville et al.). Vacuolar degeneration results in cartilagenous appearance. Foci of hyalinization, bone and even fat can be noted. When highly cellular, it is referred to as 'cellular adenoma'. When myoepithelial cells predominate, it is referred to as 'myoepithelioma' (Dardick, 1995). The treatment of pleomorphic adenoma is surgical excision (Rajendran & Sivapathasundaram; Ellis & Auclair, Bradley, 2001). For pleomorphic adenoma' of superficial lobe of parotid gland, superficial parotidectomy with preservation of facial nerve is done. For tumors of deep lobe total parotidectomy is necessary. Intraoral lesions can be treated more conservatively by extracapsular excision. Submandibular tumors are treated by total removal of gland with tumor (Bradley). Prognosis is excellent with a cure rate of 95%. The tumor is radio resistant. So radiotherapy is not indicated. Frey syndrome is one of the rare complications after parotidectomy. Malignant transformation, though rare, has been reported in about 5% of cases. Carcinomas ex pleomorphic adenoma and metastasizing benign mixed tumor are two varients of this tumor undergoing malignant transformation. Pleomorphic adenoma, though a benign tumor of salivary gland, should be diagnosed at an early stage and surgically excised. When involving parotid gland, precaution should be taken to preserve facial nerve, if possible. Care must be taken to remove the lesion entirely to avoid recurrence and malignant transformation. Department of Oral Medicine & Dept. of Oral Surgery & Dept of General Surgery , GDC, Trivandrum for the support. Neville, B. W.; Damm, D. D.; Allen, C. M. & Bouquot, J. E. Oral & Maxillofacial Pathology. 3rd ed. St. Louis, Saunders Elsevier, 2009. [ Links ] pp.477-9. Rajendran, S. & Sivapathasundaram, S. Shafer's Textbook of Oral Pathology. 6th ed. New Delhi, Elsevier, 2009. [ Links ] pp.219-24.